Setting strategic and channel direction, working toward commercial objectives and KPIs and monitoring success is great, but if you're not tracking budget or ROI per channel it's hard to understand how much money you've had to spend to see a return. This is a quick way to burn through budget you may have had to negotiate from management. If you can't prove a tactic has been successful without wasting money, it will be even more difficult to prove it's been successful, or more budget is needed to try again. Understanding the share of your budget is important in knowing where your money is being spent against what channel is providing better results. Seeing a visual of this in one place will then allow you to change budget accordingly to optimize spending and ROI. Track your acquisition for online and offline channels. Our spreadsheet covers the fundamental digital channels and bigger budget tactics such as TV, radio and direct mail. See each channel's budget cost side by side and adjust accordingly if priorities change throughout your campaign. You can also track month on month spending to see trends or forecast for popular seasonal peaks - it would be wise to invest a higher percentage of budget into a month like December if you are an e-commerce store preparing for a higher demand in products. Getting management buy-in for creative can sometimes be a challenge - it's hard to persuade colleagues why professional creative that is on brand and follows brand visions (but costs more money) is better than your marketing team creating assets in online design software for a less than £50 a month. Unless you're a small startup still getting their brand vision in-line, monitoring how much is spent on creative is vital. Creative is also fundamental for content marketing. Having a range of creative (designs and formats) allows a broader range of content to share on social media and on other owned digital channels. 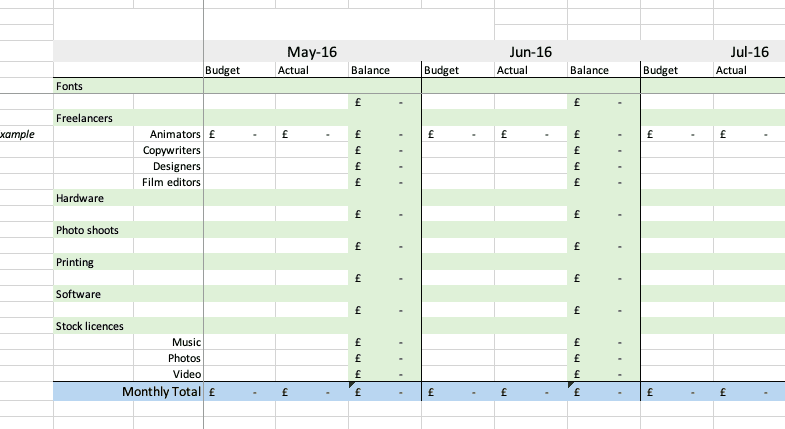 Keep track of creative spend by tracking freelance work, tools needed, printing costs and licences. Content marketing is more than writing blog copy. Bigger companies, or companies that want to penetrate the market further, need to be considering the larger implementations of content and its associated costs. Image licences, content promotion, translators (for international content), copywriters, video creation and auditing need to be company-wide and budgeted for. This can be one area of marketing that can be massively overlooked by many. This is also highly integrated with the staffing and teams spreadsheet, detailed further down. submitting your company / agency for an award can be costly, and whilst many of us would like to gain as much free PR as possible this is not always possible. Our spreadsheet calculates the total cost for all PR and events including agency management and product launch PR costs. How many tools and software licences does your company need? The essential digital marketing tools wheel shows the multitude of tools available to marketers across digital channels. Some to monitor and track visitors, some to gain and increase leads, some to help with conversion and personalization and some tools to keep subscribers, members, and customer engaged with your brand throughout the customer lifecycle. But how do you keep track of all the marketing tools you use and their monthly or annual cost? Are you trying to get management buy-in for a social media listing tool, but can't prove there's enough budget left? Or do you think your company is subscribed to too many tools that monitor / track the same data? Having a budget spreadsheet to see share percentage for each channel of marketing is essential - understand which channel is getting as much focus and adjust budget according to make sure all channels have a tool in place to help your team provide better data. Most companies will want to invest in their staff and offer training and support, but how is budget allocated? Per team, per person or is there a set amount each month for staff to use when they request? Track how much is being used for staff training versus recruitment. This makes it easy to compare how much is being invested in staff and how much in hiring new staff. It might be that spending less on training a current member of the team is more cost effective (and great for staff development) than hiring a new person of staff. 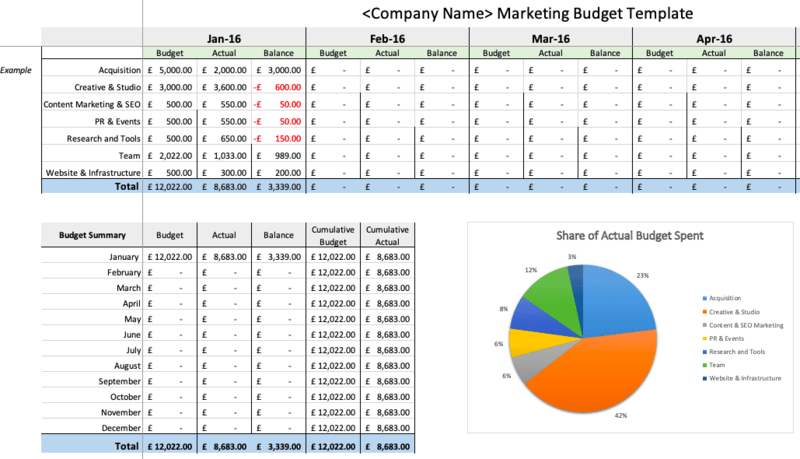 Often marketing budgeting spreadsheets offer a lot of information to track and monitor all digital channel spend against performance and ROI, but there are other costs associated with running a marketing team, such as staff travel, event travel, bonuses and staff entertainment to make sure your company has a positive working environment. Finally, how much does it cost to run your company site? This might be a cost that is pushed to the background, doesn't count as "marketing budget" or is managed at a top-level senior position that the wider team are unaware of? Consider budgeting for server / hosting costs, domain management, integrations with your site and staff training. All our budget spreadsheets are pre-designed and formatted ready to use and apply to all businesses. For businesses and agencies, our business membership options allow members to white label and present to all these templates clients.